I cannot wait for my cookbooks to arrive from New Zealand. You may call me old fashioned, but I love sitting with a pile of them, a cup of tea in hand, having a look through and getting inspired. Of course there is the internet, thousands of recipes at the click of a button, but it just isn’t the same. I told you I was old fashioned, and no I don’t own a kindle. With winter showing up every evening, the last few days have made me feel like something warming for dinner. Something to savour when it is cold outside. So I went straight to Jamie Oliver’s website and looked at his soup recipes. A mushroom soup with mascarpone leapt out and I was inspired. First of all, soak your porcini mushrooms in a little boiling water. Once they are feeling hydrated again, finely chop them, the onion, garlic and half of the button mushrooms. And I mean, really finely chop. This is how to make soup without a blender or whiz stick, so you have to do the work at the beginning. Slowly fry these in olive oil with the thyme leaves, salt and pepper. After about twenty minutes, add the water from the porcini mushrooms and the stock and simmer for another twenty minutes. When you have about ten minutes to go, add the mascarpone to the soup and roughly chop the remaining mushrooms. I fried these in some lemon zest for a bit of zing and added them to the bowls of soup at the end. 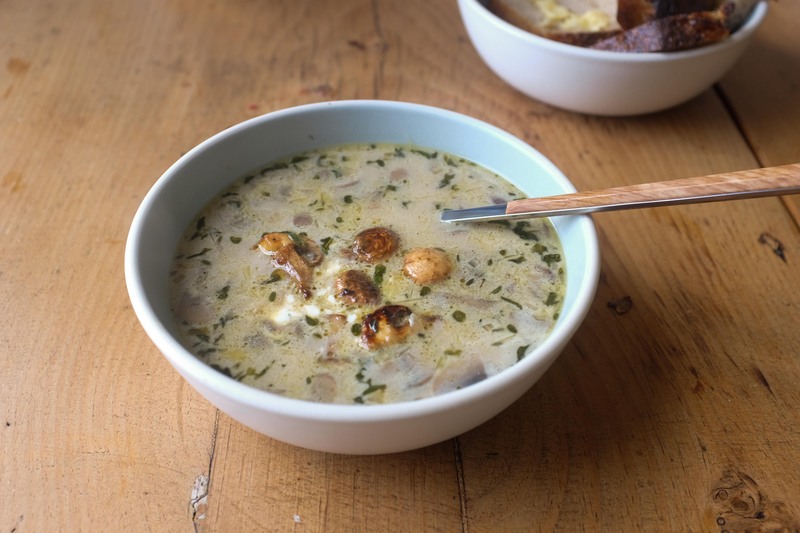 The result is an earthy and tasty soup that is rich in flavour, despite being this easy to make. Even better when mopped up with bread from The Mill.